Since 2000, Texas holds a 9-3 series lead over instate rival Texas A&M. The 118-year old rivalry ended when Texas A&M left the Big XII for the SEC. Texas A&M president R. Bowen Loftin recently told the San Antonio Express-News that he still wants the Aggies to play the Texas Longhorns. In fact, he threw down the gauntlet challenging Texas, “anytime, anywhere.” However, Loftin was a key factor in moving the Aggies from the Big XII to the SEC all but ensuring an end to the 118-year old historic rivalry. 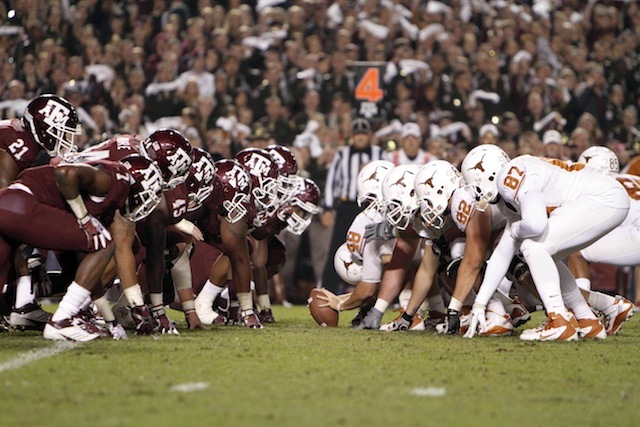 2011 was the last time these two teams met and Texas came out victorious edging A&M 27-25. The two teams first met in 1894 where Texas blanketed A&M 38-0. Since then, the Longhorns have dominated the rivalry holding an impressive 76-37-5 series record.